The Ruscaceae is a family of monotyledenous flowering plants with fleshy rhyzomes or tubers and strap-like leaves. 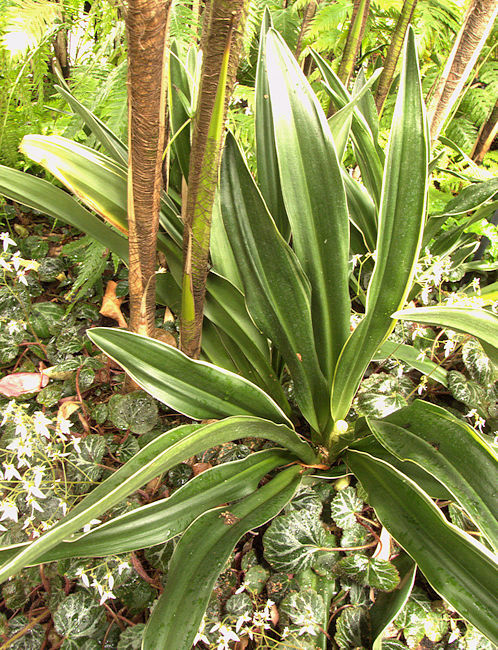 This family used to be known as Convallariaceae and includes many plants from the former Liliaceae. However in APG III it has become the Nolinoideae with a wider scope of genera. This genus includes about a hundred species of tuberous succulent plants from sub-Saharan Africa, with many species in the Western Cape of South Africa. Although listed here with the Ruscaceae, some authors place Eriospermum in the monotypic family Eriospermaceae or as a genus in the Asparagaceae. The growing points of tubers of many species faces downwards into the soil and produces leaves varying in form from single blades to a bottlebrush. Leaves and the flower shoot grow towards the surface through a sheaf of old leaves. In some species the upper surface of the leaf produces outgrowths of green tissue at right angles to the plane of the leaf (enations). Sometimes enations are branched and larger than the main part of the leaf. The inflorescence is a raceme of white or pale yellow flowers on pedicels followed by seeds densely-covered in white hairs. Most, but not all species experience Winter rainfall and grow during this season, becoming dormant during the warmer Summer months. In cultivation, it is common to plant the tuber upside down with the growing point at the surface of the soil. A small corky succulent tuber produces a tuft of lanceolate leaves with long petioles. Leaves are up to 4 in long. Flowers are yellow, well spaced along the flower stalk. Eriospermum flagelliforme is a metallophyte, native to mineralised rocky outcrops and widely distributed across sub-Saharan Africa including Namibia to Botswana, Zimbabwe, Swaziland and Eastern South Africa. Although supposedly a Winter grower, my plant comes into leaf periodically in any season. The genus Rohdea is probably monotypic for Rohdea japonica although numerous synonyms have been described. Many cultivars have been selected that differ in appearance from the wild plant. is a Japanese flowering plant with fleshy rhyzomes and a rosette of leathery strap-like leaves with pointed ends, growing about 12 in long. The inflorescence is a short, dense raceme of creamy-white, bell shaped flowers held within the leaves, followed by tight clusters of orange-red berries. 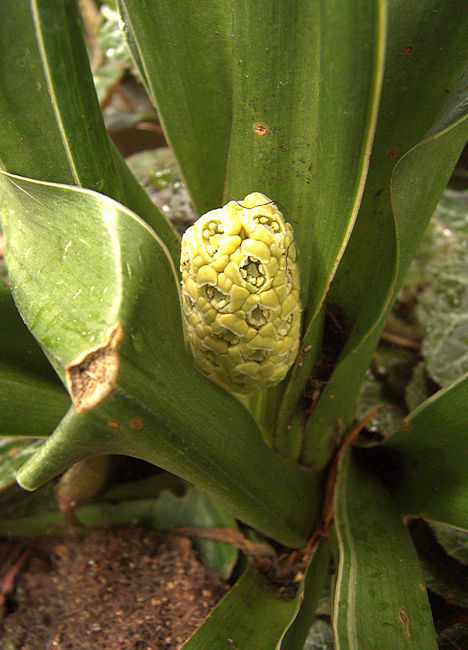 Rohdea japonica is a very popular house plant in Japan. It can be used as perennial ground cover in mild climates. 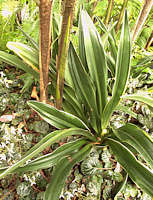 Many cultivars have been produced with variegated leaves and different leaf forms. It is not commonly seen in Europe, but is at least as succulent as e.g. Sansevieria which it resembles when not in flower. Drought tolerant, but best in moist soil. Can be propagated by division of the rhyzomes or from seed.